Composite photograph of Schulte-United personnel. Pictured are: Sibil White, Evelyn Reynolds, Elizabeth Drumheller, Fern Blanton, Mary Baker, Gaphred Jones, Mable Burke, Sylvia Dent, Pauline Giesen, Naomi Wyne, Polly Martin, Virginia Dickerson, Dovie Layton, Irene Kirtley, L.O. Sprouls, J.R. Dulmage, Alfred Taurig, V.N. Smith, Anne Smith, Mary Hinkle, Dorothy Hurd, Myrtle Burgess, Grace Via, L. May Taylor, W.E. Kennett, V.M. Brugh, J.J. Rutrough, L.L. Eanes, Nell Johnston, Rema Seagle, Bernice Carter, Nettie Board, Pauline Martin, Oneita Grubb, Eugene Taylor, W.G. Jowers, Mildred Hansbrough, Susie Bowling, Vera Calhoun, Ruth Campbell, Maude Meyers, Corrine Ayers, Grace Ratliff, Addie Wiggington, Martha Stump, Bee Moore, Bonnie Linkous, Eva Kahle, Sarah Schuff, Gorgie Routt, and C.W. Eichlin. 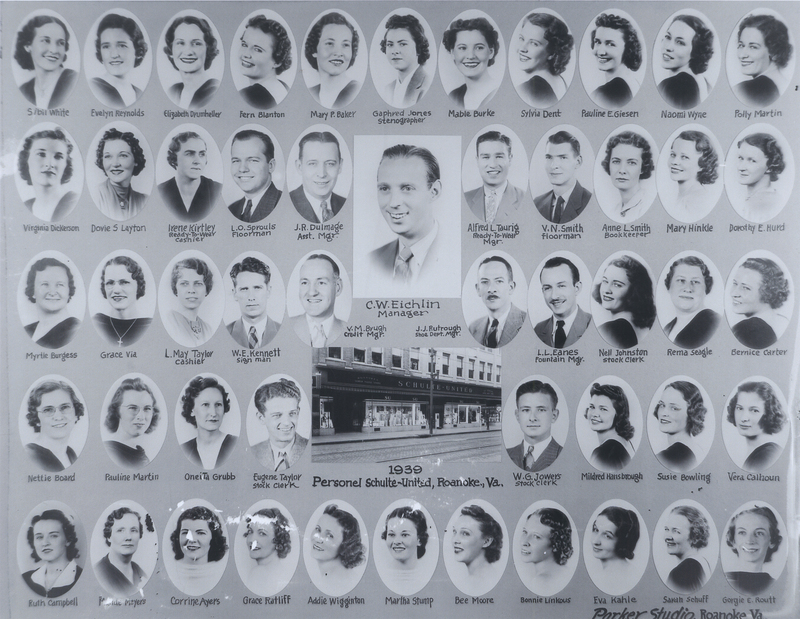 Parker Studio, “PS 276 Schulte-United Employees,” Virginia Room Digital Collection, accessed April 19, 2019, http://www.virginiaroom.org/digital/document/PS276.